A driver who failed to make a turn sent a Mercedes-Benz SUV crashing into a tree in San Marcos, causing two people life-threatening injuries, authorities said Thursday. 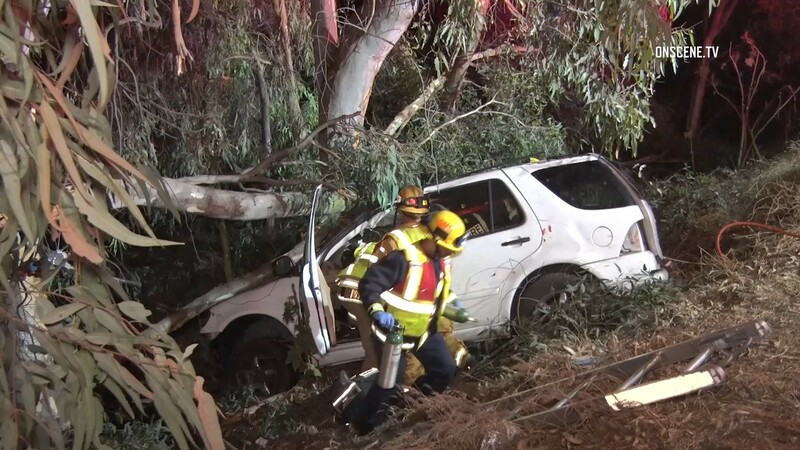 Sheriff’s deputies responded to the crash just before 9:40 p.m. Wednesday, determining the vehicle was northbound in the 100 block of Deer Springs Road when it crashed, San Diego Sheriff‘s deputy David Rosenthal said. “For unknown reasons the vehicle failed to negotiate a turn, leaving the roadway and (crashing) into a tree causing major damage to the vehicle and life-threatening injuries to the driver and passenger,” Rosenthal said. Both people were taken to a local hospital with serious injuries, Rosenthal said. No information about their identities was immediately available. Sheriff’s investigators from the San Marcos substation’s traffic division are looking into the cause of the crash but don’t believe alcohol was a factor, Rosenthal said. Any witnesses or anyone with information was asked to call Rosenthal at (760) 510-5047.